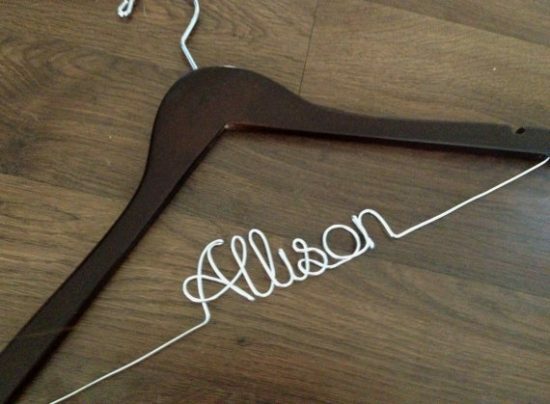 We’ve shared some awesome dress hangers for the bride in the past, but today we’re sharing a cute gift idea for bridesmaids: you guessed it, personalized dress hangers! These are a fun way to snap a getting ready photo before the wedding with your dresses all hanging in a row. Bridesmaids will love them because they’ll have a keepsake hanger to use on a favorite dress for years to come. We spotted these at Deighan Design. Aren’t those hot pink dresses so cute, too? They’re perfect for spring. Speaking of… spring, where are you?! Here in Michigan, it SNOWED again this morning. Ugh. Enough already! These hangers are adorable! What a great idea for a personal keepsake!